GoPro is a household name for action cam, but lets be honest, we all know it is designed with sports in mind and so, when it comes to everyday folks who do not do sports, it will be kind of silly to be wearing a GoPro on your head. Besides, a front-only field-of-view can hardly capture your daily adventure, isn’t it? Well, that being said, if you are up for recording your moments outside of sporting activities and have the desire to see the surrounding, then the Beoncam Removable 360 Wrist Camera is the wearable tech you have been waiting for. 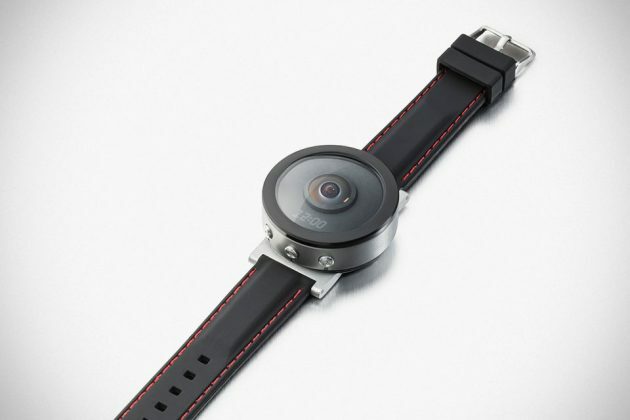 Developed by Singapore-based startup, Spacemap, Beoncam Removable 360 Wrist Camera, as the product name implies, is a wrist-worn video camera that captures stills and videos, well, kind of. It is not quite a 360-degree camera. You see, Beoncam is equipped with a 190-degree lens that captures images in circular form which, when view with the companion app, you will get the full 360-degree effect. And it does it all without bumping the images to an awful size. The recorded images are lightweight enough to allow for instant share, via smartphone, to social media sites like Facebook, YouTube and the likes, or live stream it to your smartphone. Spacemap did not specifically mention if Beoncam is of rugged built, but it does have a splash-proof design, so a little rain shouldn’t hurt. Speaking of water, Spacemap is also offering a “fully waterproof casing” for taking Beoncam into the water up to 19 feet (6 m) deep. Though, we are not sure how well the optics will perform when underwater. While it is designed to be wrist-worn, Beoncam can also be detached from the wrist strap and affixed on bicycle handle, helmet, and whatnot, with the appropriate accessory. So, in a way, it is an action cam of sort. Other worthy mentions include one-click system (for turning on/off, photo or video mode), still image resolution of 2,592 x 1,920 pixels, video resolution of 1,200 x 1,200 pixels at 25fps, live preview at HD 720p (albeit at a modest 15fps), a battery that offers 3 hours of continuous recording or up to 4 days of standby time, built-in microphone and speaker, gyroscope, plus WiFi and Bluetooth 4.0 LE connectivity. And oh, did we mention that it is also a timepiece too? And it only make sense that it does cos’ no one fancy wearing two watches on their wrist, or do you? If you are the type who video your everyday adventure, you may want to consider signing up for a Beoncam which lets you do so in 360-degree. Speaking of signing up, well, you can pick up the Beoncam Removable 360 Wrist Camera as a pre-order on Indiegogo. Depending on how soon you pledge and the options, you are looking at between $99 and $149 for a unit. If all goes as planned, Beoncam should be delivered sometime in July 2017.